This pendant is inspired by the jewellery designs found in ancient Rome. Ornate jewellery was rare due to the lack of gold but as the Empire expanded it trade routes and armies conquered other nations precious metals and stones became readily available. Roman jewellery was generally made of gold or silver and was created with Greek and Etruscan influences. 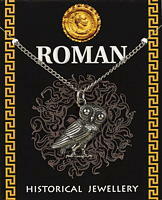 This pewter Roman Owl is supplied on a silver chain. The information on the reverse of the fold-over card describes how Roman jewellery was created with Greek and Etruscan influences. Pewter gem pendant supplied on a silver chain. The information on the reverse of the card gives a brief history of Elizabeth I and also about jewellery in Tudor times. The Vitruvian Man in pewter supplied on a silver chain. The information card gives a brief outline of Da Vinci's life as an artist. A reproduction of a Tudor thimble supplied in a clear box with information card, explaining about the Tudor thimbles and their designs. A reproduction of a renaissance thimble supplied in a clear box with information card, explaining about the thimble and its design. Gold plated pewter reproduction of a Greek owl supplied on a gold chain. The information on the reverse of the card describes how Greek mythology appears on Greek jewellery designs and coinage. A reproduction of a medieval thimble supplied in a clear box with information card, explaining about the thimble and its design.